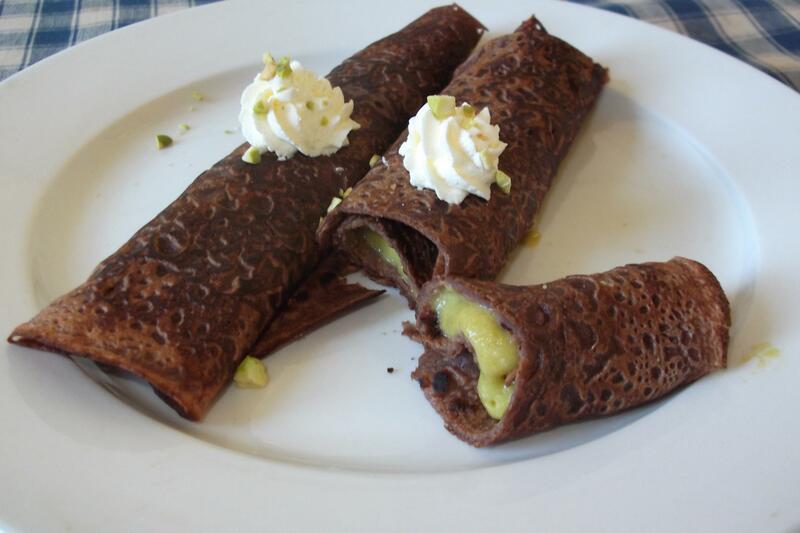 I have adapted this recipe from that on the website of La Bigoudène – a fabulous portfolio of Bretagne recipes. These crêpes are totally divine. You will need 150g of pistachio paste. I cannot find it in my province so I just had to make my own. I ground the nuts in my long suffering coffee grinder. Nor could pistachio oil be found, so I substituted it with sunflower oil and added just enough to form a paste. Break the eggs in a bowl and mix well. In another bowl sift in the flour and cocoa, then add the sugar and salt. While stirring, drizzle in the eggs, then 250mls of milk...here is the tricky part because you will need to add more but just how much more is to be guided by the consistency of the mix. I would have added another 80 to 100mls. Set aside and leave for an hour. Then make up the batch. I used my cast iron pan which has a 18cm base. Add the sugar to the paste and stir gently as you introduce the cream then whip together until the mixture was stiff. The bowl was left in the fridge until plating up. To serve, as shown, a swirl of whipped cream and a sprinkle of chopped nuts. All times are GMT +13. The time now is 02:01 AM.